Located on Skwxwú7mesh territory in the heart of the city, the digital signs flash a static advertisement every ten seconds. Using the form of tweets, artists and writers from across North America contributed text messages that interrupted the broadcast ads during April, 2011, the 125th Anniversary of the City of Vancouver. Selected contributions were translated into Skwxwú7mesh, Kwak’wala and hǝn’q’ǝmin’ǝm’/Musqueam languages. 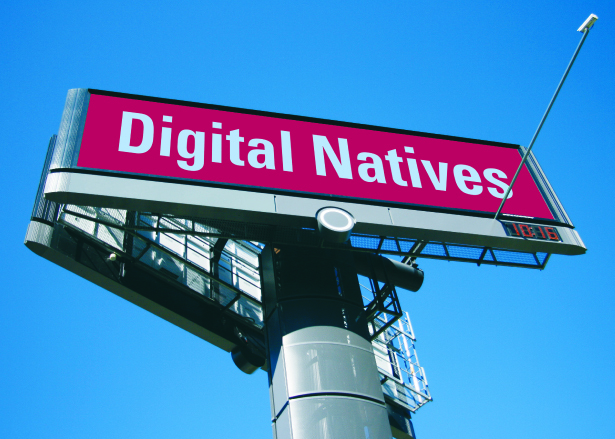 For Digital Natives, the billboard became a space for exchange between native and non-native communities in an exploration of language in public space. Interrupting the flow of advertisements, the brief messages responded to the location and history of the billboard, of digital language and translation, and of the city itself. Digital Natives integrated messages from the public, in a call-and-response generated through Twitter, Facebook and the digitalnatives.co blog. Designed by Judith Steedman, the publication includes essays by Candice Hopkins, Clint Burnham and Lorna Brown, a history of the site created by historian Susan Roy, and selected entries from the project blog along with reproductions of the work of contributing artists and writers: Candice Hopkins, cheyanne turions, Chris Bose, Christian Bok, Daina Warren, Edgar Heap of Birds, Emily Fedoruk, Henry Tsang, Jeff Derksen, Larissa Lai, Lisa Robertson, Lori Emerson, Marianne Nicolson, Mercedes Eng, Michael Turner, Peter Morin, Phillip Djwa, Postcommodity, Rachel Zolf, Raymond Boisjoly, Rita Wong, Roger Farr, Sonny Assu, Tania Willard. Digital Natives was commissioned by the City of Vancouver Public Art Program with the support of Vancouver 125 and the participation of the Government of Canada. We are grateful for the support of The Canada Council for the Arts and the Museum of Anthropology at the University of British Columbia. Digital Natives is part of the group exhibition Finding Correspondences at the Surrey Art Gallery. This exhibition features artwork by Vancouver-based Digital Natives, Kitchener-based Soheila K. Esfahani, Mark Neufeld from Winnipeg, Emilio Rojas from Vancouver, Toronto-based Tony Romano, and Ming Wong from Berlin.